July 2015 to July 2016 was the largest year of population growth for the state of North Carolina for any single-year period since the last decennial Census (2010). This was also the case for 124 of North Carolina’s municipalities, including several with previously slim or even declining population growth. These places are labeled and represented by colored markers on the Story Map below. The table accompanying each point compares the numeric and percentage growth year-to-year from 2010-2015 with the numeric and percentage growth from 2015-2016. This map reveals the spatial component that is likely driving growth for many of these municipalities. The blue and purple rings represent buffers – of 15, 20 and 25 miles, respectively – surrounding the boundaries of North Carolina’s most populous cities. Two-thirds of these newly emerging municipalities are less than 20 miles from a major city – well within a reasonable commuting distance. As noted in a previous post, a number of these prospective suburbs and exurbs were among the fastest-growing places in the state. Nonetheless, only future Census population estimates will reveal if these growth patterns can be expected to continue, and for which places. If trends do continue, this likely indicates that residents are choosing to live and commute greater distances from North Carolina’s major urban cores. There is an additional data source which may reveal the factors driving growth or decline in a given place: the measure of a population’s components of change. This is the sum of its births, deaths, in-migration, and out-migration. The Census Bureau only publishes these estimates as low as the county level, but they may still reveal developing trends in the cities and towns located there. 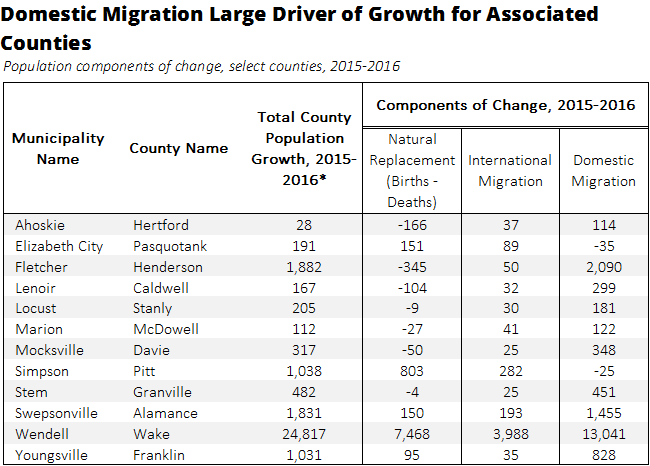 For nearly all of the municipalities’ principal counties, in-migration was the main driver of growth, according to annual estimates from 2015-2016. Several of these counties had natural decrease – where deaths outnumbered births – and migration accounted for all population gains. In most cases, domestic migration exceeded international migration. Though these estimates are for the entire county – not just the municipality of interest – the nature of this growth points to suburban and exurban relocation as the most likely cause of recent population gains. This entry was posted in Carolina Demographics, Fun Maps, Migration and tagged interactive maps, municipalities, population estimates, U.S. Census Bureau. Bookmark the permalink.